"Effective July 21, PATCO is easing its policies for bicyclists on the Speedline by eliminating permits and registration fees and allowing bicycles on all trains except during peak travel periods..."
This policy change marked the end of a decade-long process of integrating bicycles with regional rail transit. The first regional bike-on-rail permit appeared in 1989 with the opening of >NJ TRANSIT's Atlantic City Line. The permits were free and available via mail, but you had to phone in your reservation 24 hours in advance of your trip. At last, you could bring your bike via train to the Jersey Shore! A hard-fought campaign by the Bicycle Coalition of the Delaware Valley resulted in SEPTA reluctantly agreeing in 1991 to allow bikes on trains with a Bike On Rail Permit. The permit was only valid on off-peak Regional Rail, and the permit had to be renewed by mail yearly for $5. PATCO followed suit in 1993 with rules similar to SEPTA, except that you had to renew the permit in person at Camden's Broadway Station during weekday business hours. 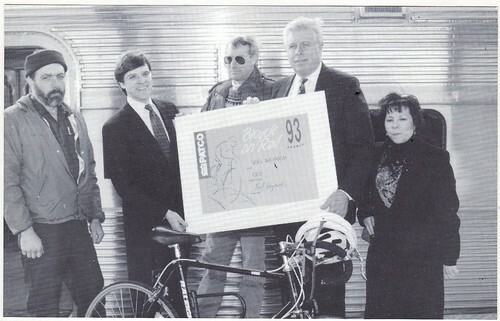 Bicycle Coalition of the Delaware Valley President Noel Weyrich (second from left) with PATCO Officials at a the official bike permit press conference in 1993. People who took the time to get a bike permit turned out to be good stewards, proving that bicycles do not delay trains or create a burden for other passengers. Still, nearly everyone had an irate SEPTA conductor story. Cyclists were sometimes left behind at stations because they couldn't find their bike permit fast enough. Conductors would tell cyclists to go to the wheelchair designated spot but refused to ask the other passengers to move. But other conductors were helpful, some taking the time to offer newbie riders tips on how to roll their bicycle down a narrow aisle or safely carry it down the steps. For many years the Bicycle Coalition worked with transit agencies to loosen the restrictive bike permits. SEPTA eventually expanded bike access to include reverse peak trains, the subway lines, and the Norristown High Speed Line. In 1997 SEPTA eliminated the bike permit, and NJ TRANSIT did the same in 2000. PATCO was the holdout, with essentially unchanged bike policies as late as 2001. The annual in-person renewal meant that only regular weekday commuters had easy access to bike permits. PATCO's automatic fare gate entry meant that permit checks were only done when DRPA police questioned cyclists, which was rare. As a result many people simply transported their bikes on trains without a permit. In July 2001 following a meeting with the Bicycle Coalition and DVRPC, PATCO General Manager Thomas R. Hickey ordered the abolition of the bicycle permit. In November 2001, during the two-month closure of the Ben Franklin Bridge Walkway following 9/11, Mr. Hickey announced that PATCO would allow bicycles at all times. With the announcement, PATCO went from worst to first for bicycle access, and this remains PATCO's policy today.